Before Aubie was the friendly tiger we know and love today, he was a vicious beast stalking opponents’ mascots on the covers of Auburn football programs. The creation of Birmingham News Cartoonist Phil Neel, from 1957 until 1976 “the tiger” terrorized every school Auburn played through a limitless arsenal of tricks, traps and cartoon hijinks. The tiger’s personality existed before he had a name. 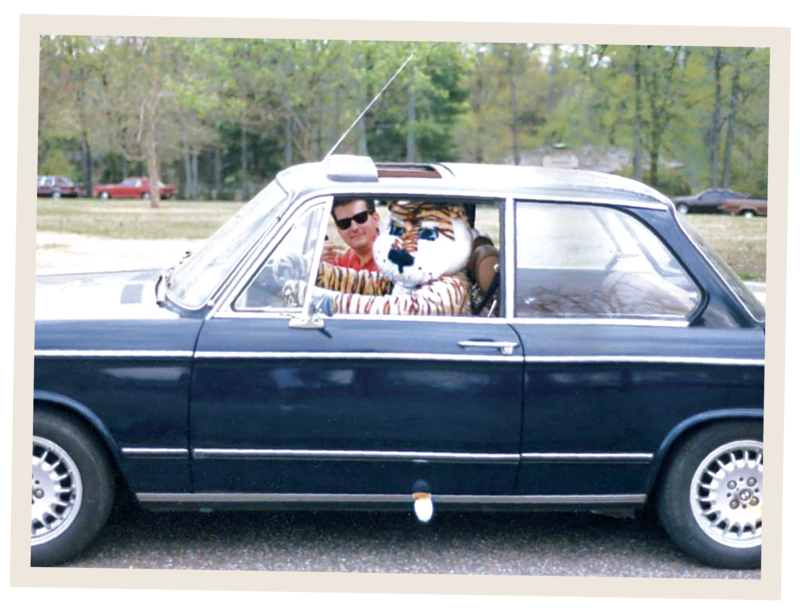 Neel’s “Aubie covers” ended in 1976, but for generations of Auburn fans, the mischievous character was as iconic as Bugs Bunny and Mickey Mouse. For then-Student Government Association Spirit Director James Lloyd ’79, who was searching for a method to channel the Auburn Spirit in a tangible form, Aubie was the perfect opportunity. But, Lloyd admits, bringing Neel’s character to life was less a priority as was having a tiger for a mascot. Lloyd spent the summer of 1978 looking for costume manufacturers, eventually landing on official costumer for Saturday Night Live Brooks & Van Horn. 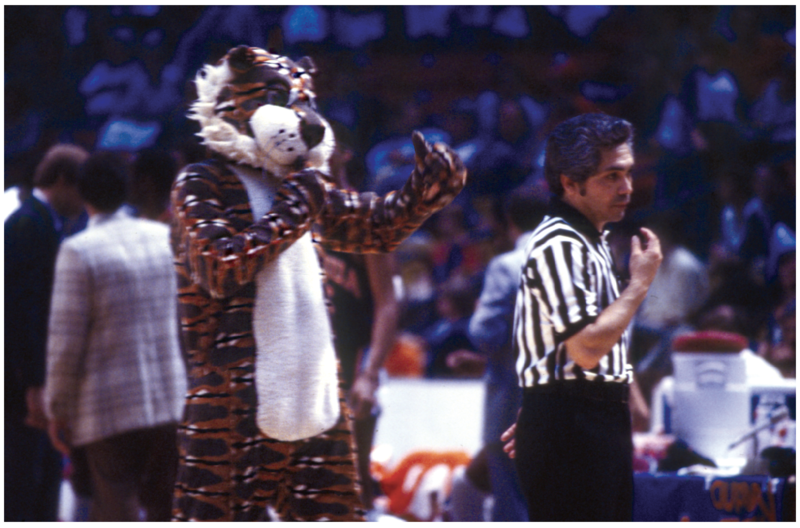 Coincidentally, Aubie was designed by Tony-winning designer Franne Lee, the creator of John Belushi and Dan Ackroyd’s “Killer Bee” costumes. Lloyd sent one of Neel’s football programs to Lee for inspiration. She sent him their best tiger-like swatches. Things were running smoothly until Lloyd got the bill: $1,300, exceeding their $400 annual budget. Lloyd asked everyone for assistance; none would take the chance, except Julian Holmes ’62, the assistant director of the alumni association. “Holmes told me ‘James, go ahead and order it, I’ll pay for it out of my pocket if we don’t raise the money’,” Lloyd remembers. The suit arrived just in time for the 1979 SEC Basketball Tournament in Birmingham. At Holmes’ insistence, Aubie arrived with Lloyd for his first official public appearance, propelling Auburn over Georgia in the first round, then to a four-overtime thriller against Vanderbilt in the second. Despite one other appearance, at the 1979 A-Day, Aubie made few public appearances but drew a considerable turnout for the first “Friend of Aubie” tryouts in the summer, which consisted of a six-minute skit competition and a series of one-on-one interviews with Lloyd. After whittling down the candidates, the inaugural class was set: Barry Mask ’80 was the primary “Friend,” while Vicki Leach Woerner ’82 (the first and only woman chosen yet) and Bob Harris ’82 were the designated alternates. For Mask, who grew up drawing Aubie from Neel’s covers, it was a dream come true, but he admits there was some hesitation toward Aubie in the beginning. No one knew what to do with him, or how to handle him, or what to expect. Dancing with the inaugural Tiger Paws, directing traffic at Toomer’s Corner, stepping with Kappa Alpha Psi, clowning around with students on campus — Aubie’s antics soon captivated the Auburn Family, but it was hard work preparing for every appearance. Nothing prepared the Friends for working on hot afternoons, though. The first suit used a quilt-like fabric with shaped padding to give a realistic appearance, but made for a truly miserable experience in the heat. For generations of Friends, it became a rite of passage. 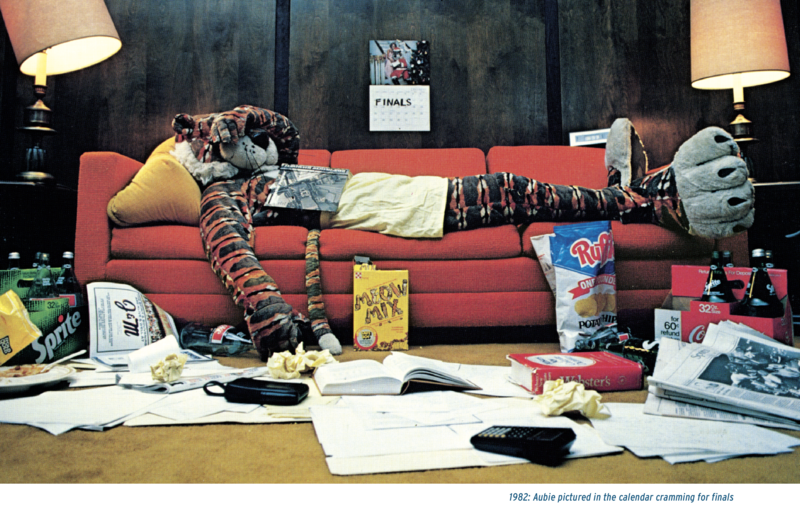 Aubie’s debut home football game was Sept. 15, 1979, a one o’clock kickoff. Mask’s plan to have Aubie leap out of a box at center field was nearly derailed by the heat. As a precaution, team equipment manager Frank Cox ’75 had taped a thermometer inside the chest. 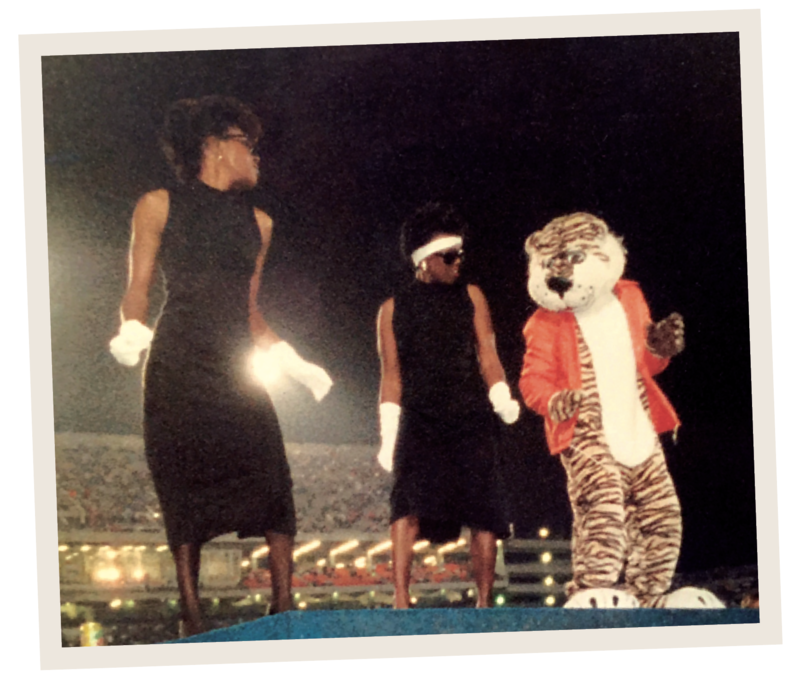 When announcer Carl Stephens said ‘introducing a new Auburn tradition, Aubie the Tiger!’ Aubie burst out of the box, into a dance routine with the band, then hurried into the tunnel. When Mask checked the thermometer, it exceeded 115 degrees. In the end, Aubie’s tail was stolen, but Auburn won the game and the ensuing drama made headlines in the Atlanta Constitution the next day, making him a household name around the SEC. “Aubie thought it would be a great idea to bring [UGA mascot] Uga a gift, so the agriculture guys wrapped a cow leg in orange and blue cellophane with a big bow that he took to Athens. As he made his way down the field, waving that giant bone to the crowd, a Georgia state trooper stopped him. Aubie was about ten feet from the “dawg house,” where the bulldog was laying on a bag of ice, and they wouldn’t let him near the dog or deliver the bone! The Auburn fans booed as the trooper walked Aubie back to the Auburn side of the 50-yard line. Mask declined to try out as a Friend again, helping organize the infrastructure around Aubie instead. A major goal was to get a new suit — better ventilation, more mobility, better visibility — using suggestions Mask had sketched. Short on funds again, Mask suggested the first Aubie calendar. Unlike Aubie’s ultra-detailed schedule now, in Harmon’s time there wasn’t even a travel budget for Aubie. “For out of town games, Aubie slept on a couch in the male cheerleaders’ hotel room and had to beg Laumer to reimburse him for a kids’ meal,” said Harmon. It was difficult being a football fan and a Friend at the same time, Harmon admits — besides poor visibility, Aubie is always supposed to face the crowd — but he traded off with alternates to watch big games so Aubie could have fun. Thanks to each incoming generation, Aubie was and remains always on top of the day’s latest dance trends, which brought in the era of the “breakdancing Friend of Aubie” Ken Cope ’85. Not everyone was always happy to see Aubie; Cope recalls some football players politely asking him to leave the locker room because he smelled worse than they did. The first football game that Warren Weeks ’86 dressed out for, he sweat out ten pounds. “We had an unwritten rule: if you throw up in it, you’re staying in it” said Weeks. Once, on a live telethon, Aubie was coerced into performing backflips and landed on his neck. There was no lasting damage, thankfully, but Aubie would use the same kind of self-effacing humor to warm the hearts of sick children. One of Week’s co-Friends that year was Jef Arnold ’86, a future colonel in the United States Marine Corps who fought in the first Gulf War and who tragically died in a plane crash in 2007. To celebrate Arnold’s life, the AUBIE Fund for Excellence in Support of Auburn University’s Official Mascot was renamed The Jefrey M. Arnold AUBIE Fund for Excellence. It remains the only endowment fund that goes directly into the Aubie Program. 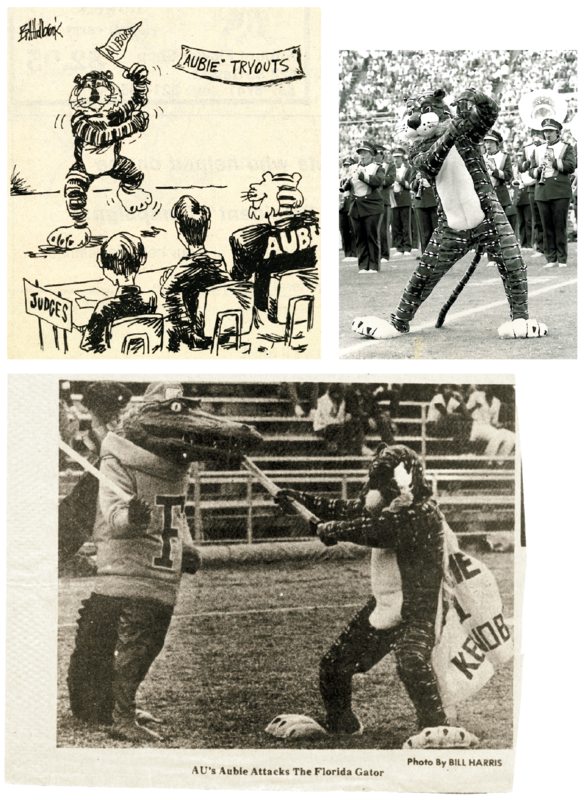 In 1991, Mike Jernigan ’92, Chris Wood ’92 and Rob Thompson ’91 helped Aubie win his first of nine Universal Cheerleaders Association Mascot National Championships. Auburn had claimed a UCA ‘blue ribbon’ awarded to the top mascot at its annual camp six times in the past, but this was the first national award of its kind. As Aubie’s fame grew, the secrecy surrounding both the program and the identities of the Friends grew also, remaining one of Auburn’s most carefully guarded programs to this day. When picking Auburn, “College Gameday” co-host Lee Corso must don an Auburn helmet, not the mascot’s head like other universities. 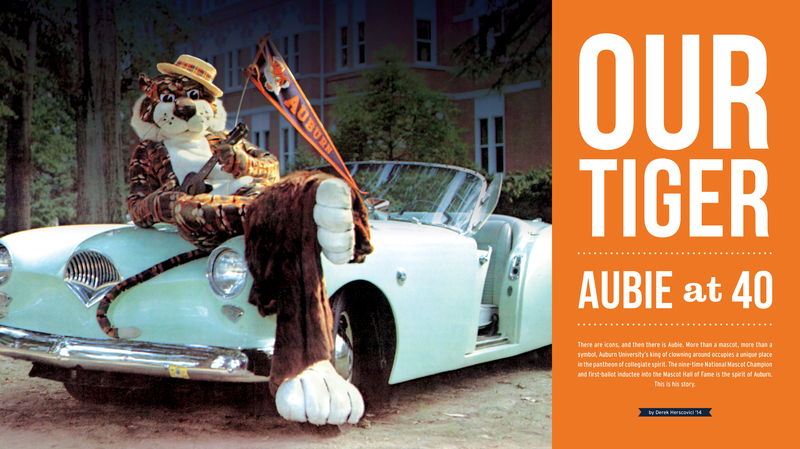 In 2006, Aubie was formally inducted into the Mascot Hall of Fame, his first time on the ballot. To be formally considered eligible, mascots must have existed for at least 10 years, have an impact on their sport and community, inspire their fans and consistently give memorable and groundbreaking performances. “One of my proudest memories is creating ‘Aubie Claus.’ Aubie took pictures in Santa’s chair at the local mall around Christmas, but in 2008 I went to [the Director of Community Relations & Spirit] Latisha Durroh ’93 and said ‘we can’t have Aubie wearing red and white. This has to stop.’ She told me if we built it, they’d pay for it; well, my mom is a seamstress, so I found the fabric, ordered it and we built that orange-and-blue Santa suit and premiered it at a basketball game. That’s the thing — you were a Friend of Aubie, but it takes a village and a lot of support. Aubie still wears the suit today, which is a huge point of pride for my mom and I. For Aubie Director Sarah Perez ’16, watching Aubie light faces up at his weekly visits to community events, hospitals and local schools always instilled a sense of pride in the program. But it was preparing for game days that she’ll never forget. Today, Aubie’s impact extends beyond Auburn. For Kevin Bryant ’16, it meant traveling to Schmid Elementary in Chicago after a YouTube video of their class reciting the Auburn Creed and singing the fight song went viral. 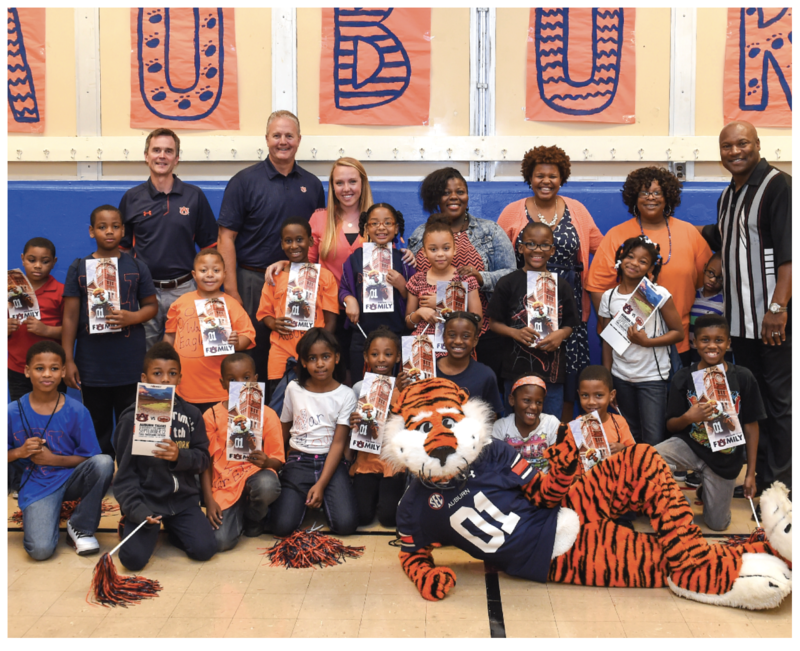 Aubie later welcomed the Schmid Elementary students to Auburn when members of the Chicago Auburn Club flew them down for a weekend on the Plains. “Being a part of their introduction into the Auburn Family will forever be one of the highlights of my time as a Friend of Aubie,” said Bryant. On September 22, 2018, the “Aubie Family” convened on the Plains to celebrate Aubie’s 40th birthday. Hosted every five years, reunions number in the hundreds and continue to grow each year. 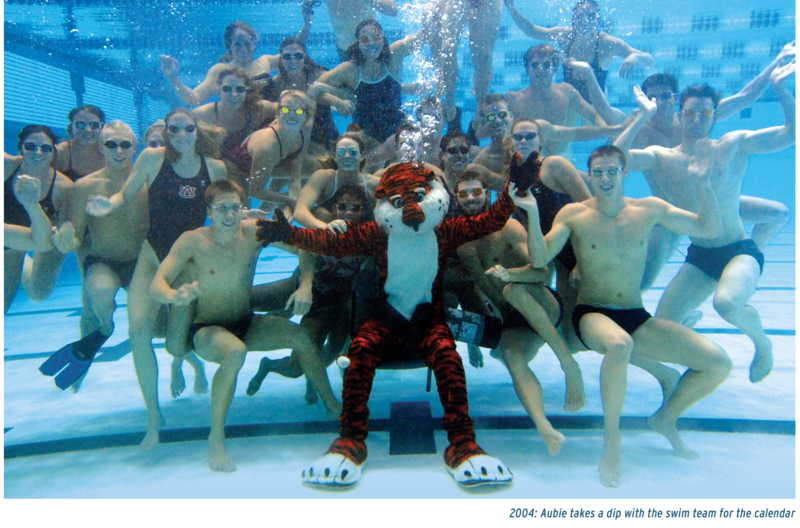 These days Aubie makes over 1,300 different appearances throughout the year, requiring precise coordination from a team of Friends and Aubie Directors. Every Auburn fan has their own description of Aubie, but the one thing they’ll all tell you is Aubie isn’t just a tiger.